We're winding down to the end of October, which in Alabama means the trees are just reluctantly beginning to turn, the temperature is like a tricky faucet that runs variously a few degrees too cool or too hot, and although the tall boots and sweaters are everywhere you look, and the specter of Halloween and pumpkins and hay bales looms (not to mention the retailers already stocking Christmas foofaraw), it's pretty still decidedly late summer in the Deep South. Or at least that's what I'm telling myself. 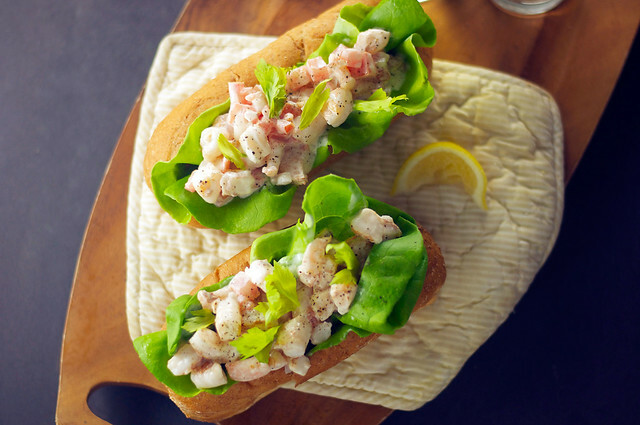 Because I decided, apropos of pretty much nothing, that a great idea would be to make for dinner last night that most classic of summer sandwiches: the lobster roll. Except I don't like lobster. and I just knew that once that bag was open those little leftover guys were going to go freezer-burned pretty quickly if I didn't find good uses for them. I was a little skeptical about the frozen shrimp; I don't as a rule have anywhere near the patience required to properly thaw things, and I've tried quick-thawing with mixed results. (See above re: patience.) But these were petite shrimp, so they defrosted fairly quickly, and it was pretty great to have them already peeled and deveined for my lazy pleasure. 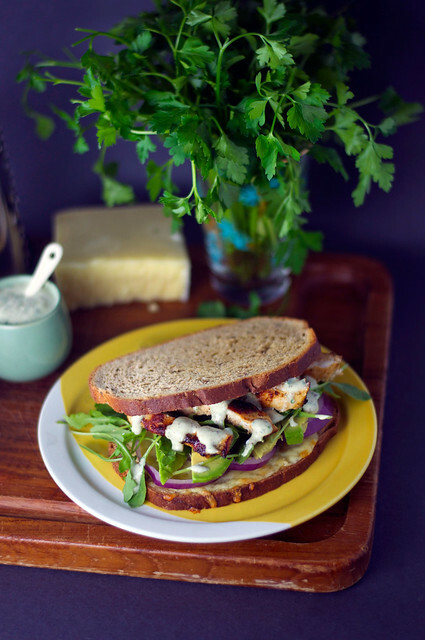 I will make no bones here: This is simplicity in sandwich form. I sautéed the shrimp in chili oil to have a hint of heat in the background, but it's not necessary; you can add a little more black pepper or even a few dashes of hot sauce to the dressing, if you like. Use whatever fat you choose sparingly in any case, because a drier pan will help you achieve a nice brown crust on the outside of the shrimp. Any bread of your choice will work here. I picked a wheat grinder roll, cut the top off, and scooped out the middle to make room for the good stuff. Wheat is by no means a game-changer; my mama always told me wheat > white, and old habits die hard even when I know "wheat" on the bag of bread means just about nothing nutritionally anymore. In today's Do As I Say, Not As I Do lesson, mix up the shrimp salad before adding the lemon juice. Depending on the moisture from the shrimp and the tomatoes, too much juice can make the mixture a little watery. If you achieve the consistence you like and want more tart lemoniness, stir in a little zest. The celery leaves were an abstract idea I had noodling around in my head; I wasn't sure I wanted the texture of the celery stalk itself, but I liked the idea of the flavor, and of course the fresh green color for garnish. In the end it turned out to really change the character of the dish in a remarkable and lovely way. I would by no means advocate thinking that buying an entire bunch of celery (seriously, why must I purchase so much at a time?) is necessary for this dish, but if you have some lapsing in your refrigerator, as I did, this is a terrific way to use it. 1. Heat oil in a medium skillet over medium heat; add shrimp, and cook 2 minutes on one side or until golden brown. Flip shrimp, and cook 1 more minute or until golden brown on second side; remove from pan to cool slightly. When cooled, chop each shrimp into 4 even pieces. 2. Stir together mayonnaise and next 3 ingredients; gently fold in shrimp. Stir in lemon juice until desired consistency. Chill 15 minutes. 3. Line each roll with 2 pieces Bibb lettuce. 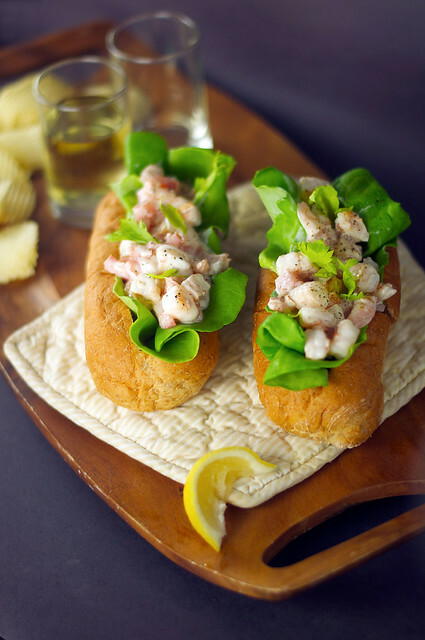 Top with shrimp salad and celery leaves, if desired. Makes 2 servings. 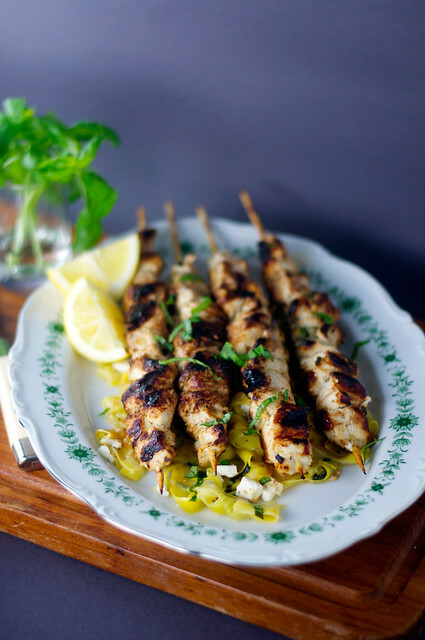 *easy grilled chicken skewers + feta-basil yellow squash. "I may never cook chicken any other way ever again." OK, that's a little dramatic. But I may never cook chicken breasts any other way ever again. Over the past few years, I've developed a real distaste for chicken breasts, mostly because the texture of your average grocery store offerings has just become dreadful—it tastes waterlogged and pumped full of ... something. It manages to somehow become both mealy and stringy at the same time, and so enormous as to make me uneasy and them impossible to cook to satisfaction. Dry on the outside, suspect on the inside; this is the new world of white meat chicken. And the smaller, higher quality, more expensive organic chicken breasts don't get a pass, either—they often seem big and bland to me, too. So what's a carnivore to do? I will continue to buy those better breasts, but instead I'll cook them like this: marinated in tenderizing citrus and jammed onto a skewer shwarma style, and then charred over a great big heat. I have a healthy (I hope) fear of fire, so I will admit I use my sweet little outdoor Weber as a rain gauge. I cooked these inside, on a grill pan, but they would be wonderful with a nice charcoal smoke to them, too. I have convinced myself that the gas flame beneath my pan means it counts as grilling. Don't burst my bubble. An hour in the marinade is just about perfect—any longer and that lemon will have a chance to overdo it. I used sour cream here, but you can substitute plain Greek yogurt. Just look for the lowest sugar content you can find, because you want the color on the chicken to develop slowly, without burning. The flavor is bright and summery, which means it pairs beautifully with almost anything—lemony orzo, garlicky new potatoes, even just a simple tomato salad. I went with yellow squash, which I don't even like but thought would be pretty. And it turns out if you sauté that business in butter and toss in basil and cheese, you will like just about anything! I scarfed down those veggies faster than I ever thought I would. Turns out I'm never making yellow squash any other way again, either. I used a vegetable peeler to cut the squash into thin ribbons. That's required, but it does mean that it cooked in about 30 seconds. You want it to be tender but still crunchy, and not have a time to sweat out, which will give you kind of a watery mushiness. Just in the butter, toss, garlic salt, pepper, less than a minute, and off the heat to stir in the cheese and basil. It's light, delicious, and perfect for the season. 1. Thread chicken onto skewers, pressing pieces very close together. In a small bowl, whisk together olive oil and remaining ingredients. 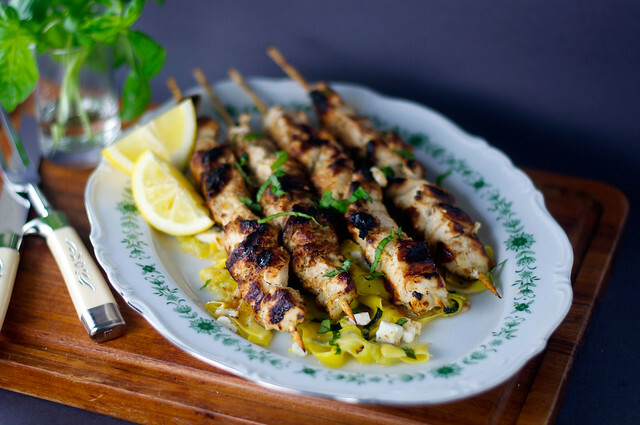 Pour marinade over chicken skewers in a shallow dish, turning to coat; cover with plastic wrap, and chill 1 hour. 2. Heat a grill pan over medium-high heat until very hot. Grill skewers, turning occasionally, 20 minutes or until outside is well marked and chicken is cooked through. Makes 4 to 6 servings. 1. Trim ends from squash, and peel into thin ribbons with a vegetable peeler. 2. Heat butter in a skillet until melted; add squash and garlic salt and pepper to taste, and cook, tossing constantly, 1 minute. Remove from heat, and stir in cheese and basil. Makes 4 servings. I promise that this will not become a weather blog, but I do find myself almost literally swinging the way the wind blows during this predictably schizophrenic Alabama spring. This week it went from 80 degrees to a hard freeze in the span of 24 hours, and even though I heard a lot of lamenting of respiratory illness and lauding of the Farmer's Almanac, I rather relished the opportunity to indulge in one last soup of the season. I'm calling this one Chile Relleno Soup because that's what it's inspired by and essentially what it is, but I debated whether to saddle it with that name—there's a restaurant near me that serves what they call "Reuben Soup," and I've often felt that there is something vaguely off-putting about the sound of pureed sandwich. The bright, tangy, soupy base here is blended until smooth, but there is still lots of hearty chunkiness about it from the beef and beans. 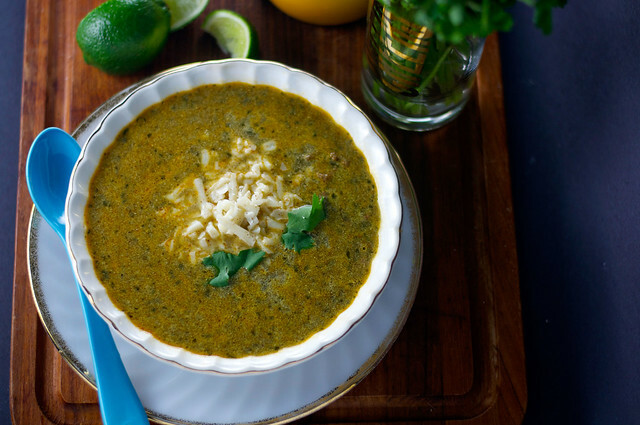 The protein here is completely optional and flexible—this could easily be vegetarian or feature chicken or shrimp as the meat; just use whatever you like in your chile rellenos! This bowl calls for more than a whispery sprinkling of cheese. You want, as Dr. Niles Crane once put it, "a full-throated shout." (I do love Frasier.) My peppers were brilliantly peppery but still mild, so I dusted the cheese with a pinch of cayenne, which gave things a nice heat and prevented the cheese from clumping together in the soup. Half of my DNA comes straight from Wisconsin, so I am not ever picky about cheese, but I do think Monterey Jack is the ideal choice here. It was just perfect. As an aside, that bunch of cilantro in the background represents something I discovered recently, which is that my herbs last much longer if I put them in a tall, narrow glass with about an inch of water at the bottom and do not refrigerate them. They thrive like cut flowers, which, der I suppose they are. Sure, that seems like the kind of thing it should take a person 34 years to figure out. 1. Preheat broiler. Place first 3 ingredients on a baking sheet or broiler pan; broil, turning once, until skins are charred. Remove peppers and tomatillos to a bowl, and cover with plastic wrap. Let stand 10 minutes. 2. Meanwhile, heat a Dutch oven over medium-high heat; add beef, cumin, chili powder, 1 teaspoon kosher salt, and ½ teaspoon black pepper, and cook, stirring occasionally, until beef is cooked through. Remove from Dutch oven with a slotted spoon, and set aside. 3. Remove skins, seeds, and stems from peppers. Return Dutch oven to stove over medium heat; add green onions, peppers, and tomatillos, and cook 3 to 4 minutes or until onions begin to brown. Season with kosher salt and black pepper. Stir in garlic and cilantro leaves, cook 1 more minute. 4. Stir in 2 cups beef broth and ¼ cup pinto beans; puree mixture with an immersion blender until smooth. Stir in remaining 2 cups beef broth and remaining beans; whisk in sour cream until fully incorporated. Stir in reserved beef, and simmer until heated through. 5. Toss cheese with red pepper, if desired. 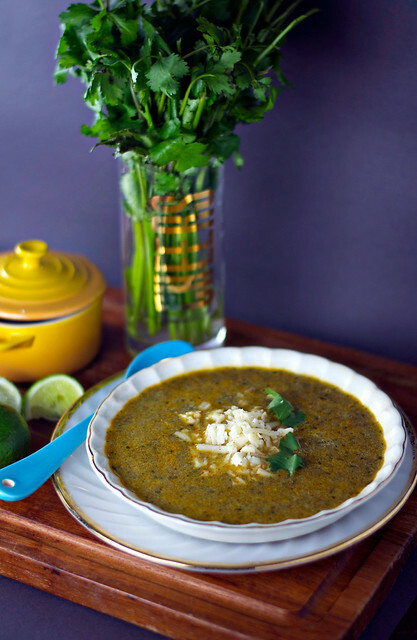 Serve soup with cheese and lime wedges; garnish, if desired. Makes 4 servings. 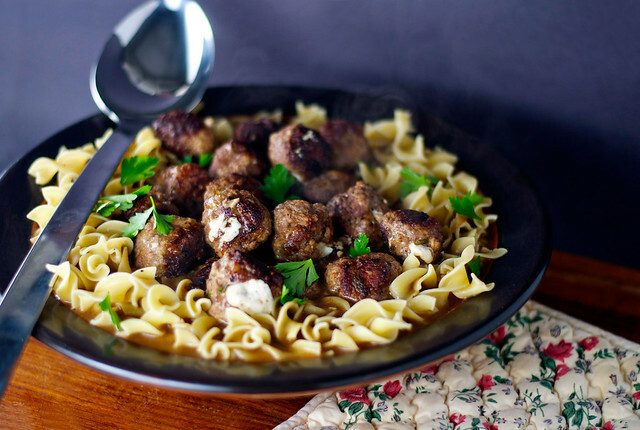 *mozzarella-stuffed meatballs with eggy noodles. It's Friday in Birmingham. It's 70 degrees, and the birds are singing manic tunes outside my window, flogging the life out of the few rain-free hours they're going to get today. The sky is still gray, but the clouds have pulled back a bit above the scene so that there's enough light for me to see just how green everything is beginning to get. Inside, it's hushed, as people tiptoe and murmur through the end of this quiet week that children and people who have children call Spring Break. In short, it's nice. It's calm. Deadlines are on the horizon, but not just yet. There's a weekend of nothing-planned around the corner. Well, let's be clear: I have a cold. A cold is more nuisance than illness. But it does mean that I feel a little more subdued than normal, ready for the clock to tell me I can put on flat shoes and wash my face. More than ready to stop punctuating the stillness around me with the sound of my honking nose. The weather has been a little rickety in these parts lately, as it is in the South when the weirdest winter in recent memory gives way to an uncertain spring. And the spring tornado season! Yay! (Not to be confused with the summer tornado season or the winter tornado season or the fall tornado season. Pack your moving truck today!) What all that means is that this week we've had a 70-degree day and a hard freeze. And that can make a person feel a little (ahem) under the weather, if the old wives are to be believed. It's not surprising then, that the Brussels sprout salad that had been noodling around in my head all week got a swift kick to make way for this big bowl of comfort food. I don't remember eating a lot of egg noodles in my youth, but somehow they still conjure comfort to me. They require virtually no effort, so that's a big part of the allure. But they're also slurpy and satisfying, and they cling to sauce like a dream. I originally envisioned the meatballs as larger than I might normally make them, all the better to envelop bocconcini of mozzarella. But the bocconcini at my local market were much larger than I'd imagined they'd be, so I decided to go with this brand, which sells smaller bites, about the size of big marbles, marketed as mozzarella pearls. Oh and then I squidged some Romano into the meatball mixture because I had some in the refrigerator that needed using and because cheese makes you feel better. Trust me, I'm a doctor. It's best to pack the meatballs fairly firmly, so that the cheese doesn't ooze out, but if some manages to escape (see below), well all the better. This is comfort food, after all, and we are not aiming for perfection. 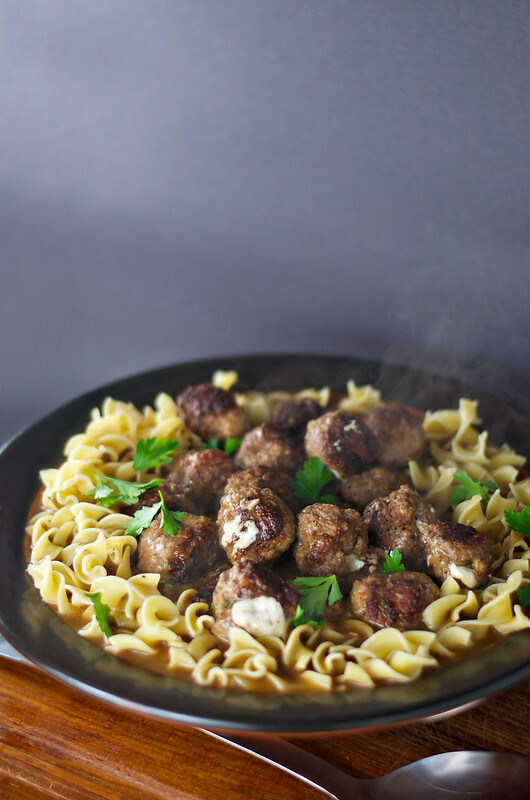 Because they are a little more tightly wound than traditional meatballs, though, I really suggest searing them in a pan and then finishing them in the sauce—it keeps them nice and tender. I sautéed fresh spinach leaves with garlic, salt, pepper, and dried crushed red pepper on the side, because I figured my immune system probably would like to make the acquaintance of a vegetable every now and again. But you can serve this just as it is, whenever you need a little comfort. Whether you're under the weather or just over it already. 1. Cut onion into quarters. Grate ¼ onion on the fine side of a box grater into a medium bowl. Add beef, egg, next 5 ingredients, and Romano cheese, if desired; mix with hands until just combined. Place about 2 tablespoons beef mixture into the palm of your hand, pressing lightly into a small patty. Top with a mozzarella pearl, and form mixture around cheese to make a meatball. Repeat with remaining beef mixture and mozzarella. 3. Meanwhile, dice remaining ¼ onion. Remove meatballs to a plate, and add diced onion to skillet. Cook 2 minutes or until softened and lightly browned. Add garlic; cook 30 seconds or until fragrant. Add butter, stirring until melted. Whisk in flour, and cook 2 minutes. Whisk in beef broth until smooth. Season with salt, black pepper, and ground red pepper to taste. Continue cooking, stirring occasionally, until mixture thickens and comes to a boil. Return meatballs to skillet, cover, reduce heat to medium-low, and cook 20 minutes or until meatballs are cooked through. 4. Meanwhile, cook egg noodles according to package directions. Top noodles with meatballs and sauce; garnish, if desired. Makes 8 servings. 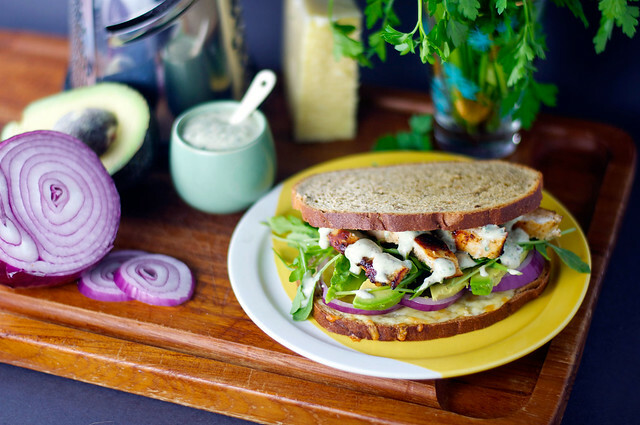 *parsley-marinated chicken and cheddar on rye. The dressing here is the real revelation. I bought vegenaise for the first time, because I am a person who loves mayonnaise, has hypertension, and is always curious about new things. This can absolutely be made with traditional mayo, but I was floored by how much I liked the vegenaise—it has a brightness and complexity that mayonnaise just cannot match. Yes, I put a vegan product on my chicken and cheese. I have a brightness and complexity, too. 1. Place first 7 ingredients in a blender; blend until smooth. (You can also use a tall vessel and an immersion blender, as I did.) Season with salt and pepper to taste. Pour half of sour cream mixture over chicken breasts in a shallow dish, reserving remaining marinade. Cover chicken and marinade, and chill 1 hour. 2. Heat oil in a heavy-bottomed skillet over medium-high heat until very hot. Add chicken; cook 6 minutes, turn over, and cook 6 more minutes or until a thermometer inserted in thickest portion registers 160 degrees. Remove from skillet and set aside to cool slightly. 3. Preheat oven to 350 degrees. Top 4 bread slices evenly with cheese. Bake 4 minutes or until cheese is golden and bubbly. 4. Slice chicken. 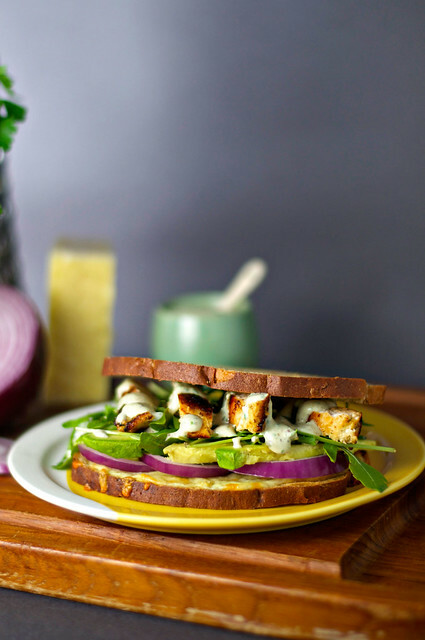 Top cheese with onion slices, avocado, arugula, and chicken. Spoon over reserved marinade, and top with remaining bread slices. Makes 4 servings. 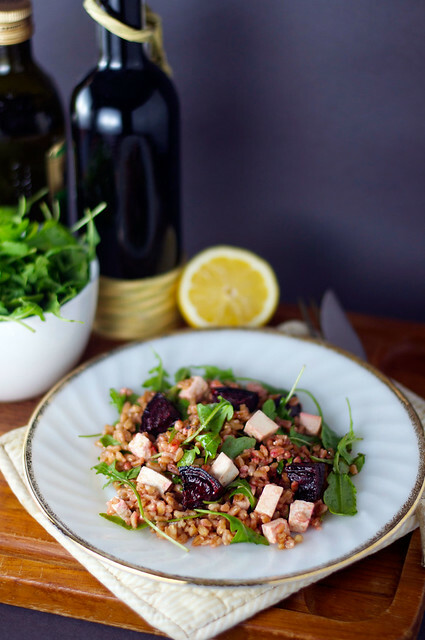 *farro salad with arugula, beets, and ricotta salata. I'm sure there's some easily identifiable psychology behind this fact, but I find that when I eat out or opt for convenience foods, I'm attracted to routine: the same turkey sandwich meal after meal, the same cheese snacks or Mexican food. I don't know if there's comfort in that familiarity or if I just cannot ever get enough sandwiches, but I do know that the precise opposite is true when I'm cooking for myself. Keeping my brain—and my stomach—engaged in the kitchen has a lot to do with trying something different. Of course I do have recipes that I return to again and again (ahem) because I am nothing if not a firm believer in the delicious, but I get stymied a lot just trying to answer the question, "What sounds good for dinner tonight?" This was a dish that I first had at Bottega Café here in Birmingham, and I want to go on record as saying I in no way mean to insinuate that I re-created a meal worthy of that kitchen full of talented, professionally trained people. What I did want was to approximate it, so that I could be reminded of that incredible salad in my own humble cocina. The fact that it's a salad in itself helps; the ingredients, independent of the dressing, are all identifiably in front of your face: arugula, farro (YAY FRESH MARKET SELLS FARRO), beets, ricotta salata. These are not, in the effort of full disclosure, ingredients that I'm prone to be especially overjoyed by. But that's the genius of those talented, professionally trained people I mentioned earlier—the can introduce you to combinations that change the mind of your palate. Or, you know, a metaphor less tortured than that one. I don't know what Frank Stitt puts in his salad dressing. I used what I had on hand. All I knew is that it should be a light, slightly vinegary, brightly citrusy vinaigrette. Farro might not be a grain that everyone is familiar with, but I loved it instantly. It has a wonderful, hearty chew. And it's terrific for leftovers, because even though this salad is undeniably healthy, it's also extraordinarily stick-to-your-ribs filling. The ricotta and the beets are terrific partners; the super salty cheese and the super sweet beets create a lovely balance with the peppery arugula. I will admit that this was the first time I've actually dealt with cooking beets myself. I was well prepared for the stained fingers I knew were inevitable, but it was such a nonevent that I was a little surprised. I just dug in with my bare hands and decided to accept whatever red tint came my way, but by the time I was halfway through doing the dishes, it had all washed away. A couple of notes of caution regarding leftovers: The arugula will wilt considerably. I'm not bothered by that, but if it's not your cup of tea, you can easily stir in some lively greens each time you plate up an individual serving as opposed to stirring it all in from the beginning. Also, I like the way these flavors work at sort of a cool room temperature, so I just pull it out of the refrigerator in the morning, and by lunchtime it's exactly right. So try a little something different. And when you do, let me know what you think! 1. Preheat oven to 400 degrees. Cook farro according to package directions. Set aside to cool. 2. Meanwhile, place beets on a baking sheet, and toss with 1 tablespoon olive oil, salt, and pepper. Roast 35 to 40 minutes or until beets are tender. Set aside to cool. 3. Mash garlic and a generous pinch of salt with the flat side of a chef's knife until a paste forms. Place crushed garlic, lemon juice, vinegar, and 2 tablespoons olive oil in a jar with a lid; shake until combined. Season with salt and pepper to taste. 4. 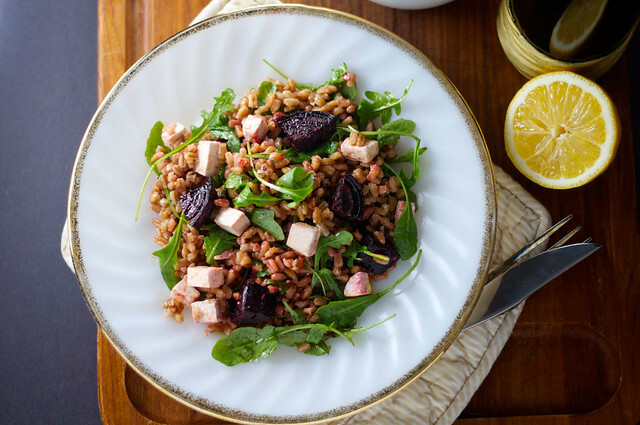 Toss cooled farro and beets with arugula, ricotta, and dressing. Makes 4 servings.